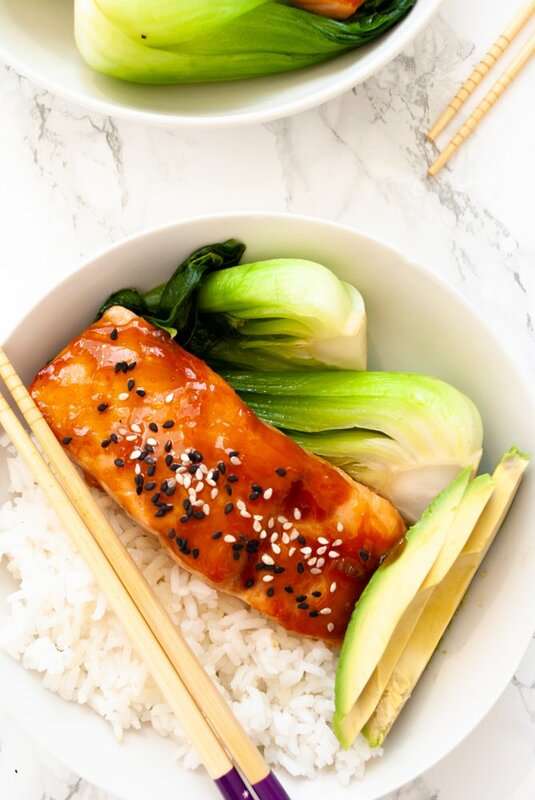 Easy oven baked salmon in a quick homemade teriyaki sauce with stir-fried bok choy, rice and avocado. 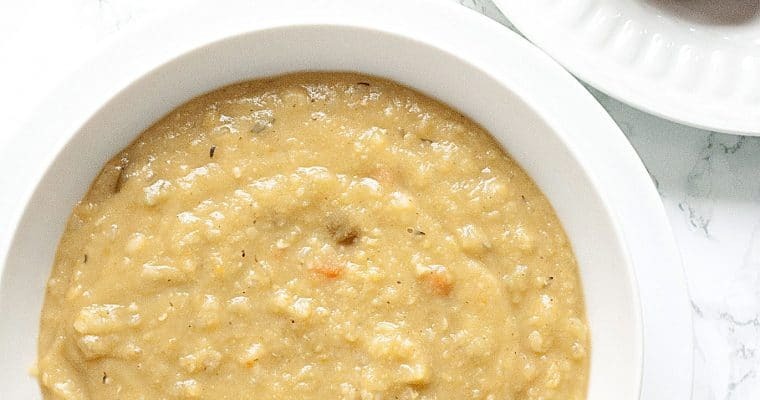 Perfect for weeknights, this nourishing bowl is on the table in 20 minutes! This teriyaki salmon bowl is my new favourite easy meal! 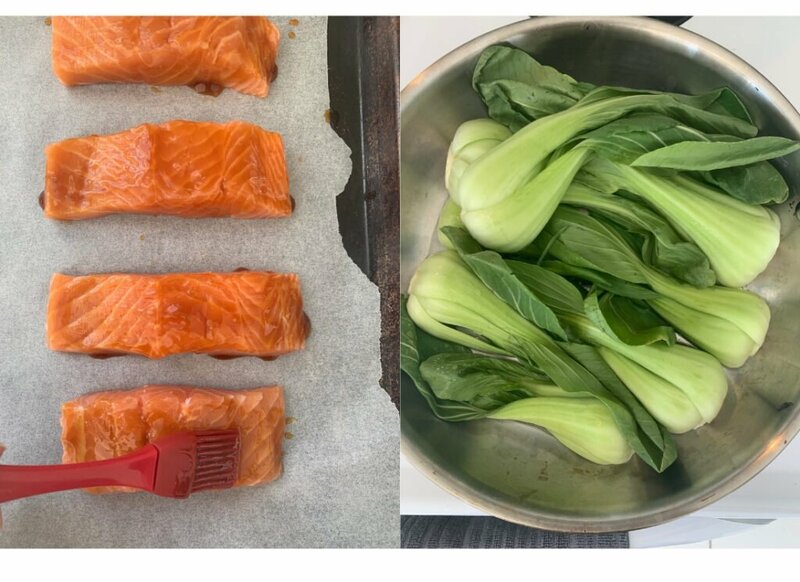 The homemade teriyaki sauce comes together in minutes and the oven baked salmon is perfectly moist. 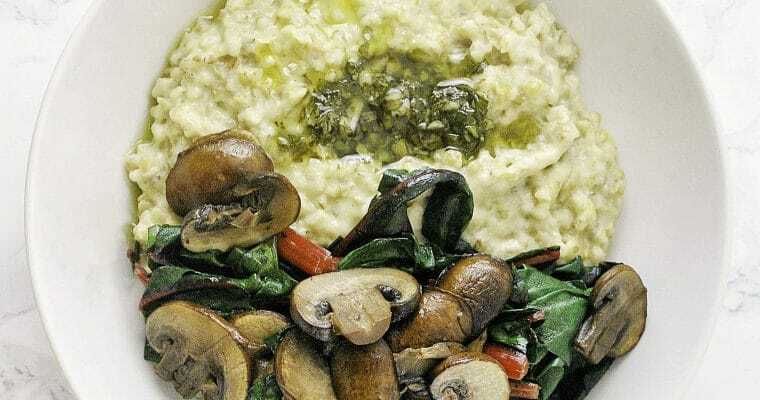 If bok choy isn’t your thing, you can substitute for whatever greens make you smile or even whatever you’ve got hanging around your fridge. Cook your rice according to package directions and heat your oven to 400℉. While the rice is cooking, add the tamari, honey, water, garlic, ginger and cornstarch to a small sauce pan. 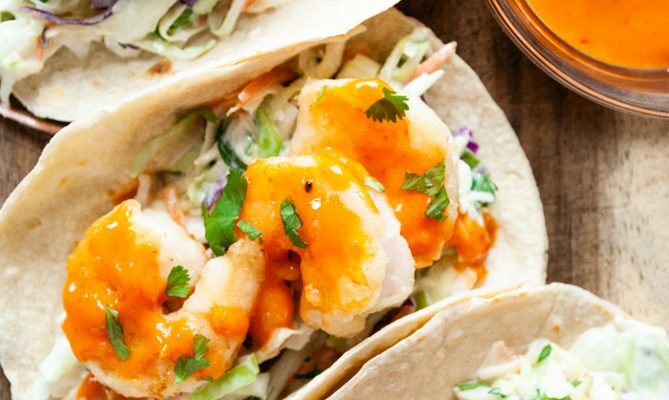 Bring the sauce to a boil then reduce the heat to low and allow it to simmer for 5 minutes. Place the salmon fillets on a parchment lined baking sheet. Take about 1/3 of the sauce and brush all over to top and sides of the salmon then put the tray in the oven and bake for 10 minutes. While your salmon is baking, heat a skillet to medium heat high and add a splash of olive oil. Add the sliced bok choy and stir fry until they are tender about 3-5 minutes. To serve, add rice to a bowl, top with salmon, bok choy and sliced avocado. 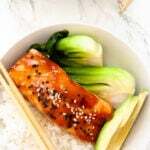 a quick and easy rice bowl with teriyaki salmon, bok choy and avocado. While the rice is cooking, heat a small saucepan to medium high heat. Add the tamari, honey, garlic, ginger water and cornstarch to the saucepan and stir to mix. Bring the sauce to a boil, then reduce the heat to low and allow it to simmer and thicken for 5 minutes. Brush each piece of salmon with a bit of the sauce, reserving at least half of it. Bake the salmon at 400℉ for 10 mins. While the salmon is cooking, heat a large fry pan to medium high heat and add a splash of oil to the pan. When it is heated, add the halved bok choy to the pan and stir fry for 3-5 minutes, or until the bok choy is tender. 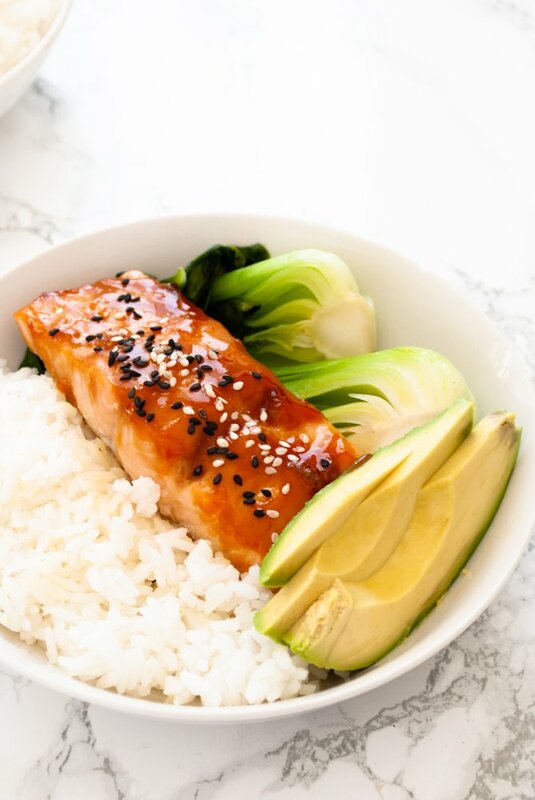 Divide the rice between 4 bowls, top with a piece of salmon, bok choy and avocado. Drizzle the remainder of the teriyaki sauce over the bowls.